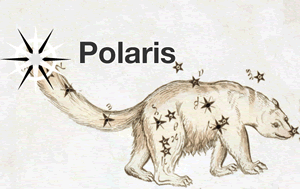 Polaris is a distinct yellow star at the end of the tail of the little bear, Ursa Minor, and is today’s North Pole star. As the star closest to the North Pole, it has been used as a navigational aid since antiquity. Its very position has meant that peoples of all cultures have seen it as a beacon or pointer, showing a true unswerving path. This has not changed, for Polaris is still, today, the Pole star for the northern hemisphere and as such, contains the symbolic meaning of being a path-finder. So with this star’s quality, you are a person who can navigate your way through a problem, find solutions where others cannot, or act as a leader for a group leading them through uncharted waters, mentally or physically. This star adds an independent attitude to everything it touches; having this star active in your life means that you have the courage to be a sole adventurer while at the same time being willing to lead others to places they have never been. The gift of being a pathfinder is however not to push forward but rather to know where you are in relationship to where you have been. In this regard you are a map-maker. This quality of a solid focus is combined with your Venus, your social ideas and attitudes to your personal relationships. In its simplest expression it adds the quality of loyalty to all your friendships and you stick by your friends through thick and thin. You also carry the same commitment into your personal relationships, understanding that relationships take work and persistence. This can provide you with a social life that is filled with the comfort of old friends and give you the joys of long-term relationships. The shadow side, however, is that you have the potential to become overly focused on another individual. When younger this may have been as a fan, where you were fixated on a celebrity. This obsession, however, can be directed onto a public figure, leading you to totally support or detest that individual. Such obsession diminishes your ability to make judgements and blocks you from seeing the complexity of life. The same tendency can also make you blindly loyal to a social ideology, or to a political or religious argument. Such blinkeredness can lead you into the world of the fanatic, who maintains loyalty and devotion to a cause despite matters of personal safety or social responsibility. Thus the gift of this star is the joy of long-term friendships and relationships based on your loyalty, but real loyalty is also seeing and accepting the shades of grey in the ideas and people that you love. This quality of a solid focus is combined with your Venus, your social ideas and attitudes to your personal relationships. In its simplest expression it adds the quality of loyalty to all your friendships and you stick by your friends through thick and thin. You also carry the same commitment into your personal relationships, understanding that relationships take work and persistence. This can provide you with a social life that is filled with the comfort of old friends and give you the joys of long-term relationships. The shadow side, however, is that you have the potential to become overly focused on another individual. When younger this may have been as a fan, where you were fixated on a celebrity. This obsession, however, can be directed onto a public figure, leading you to totally support or detest that individual. Such obsession diminishes your ability to make judgements and blocks you from seeing the complexity of life. The same tendency can also make you blindly loyal to a social ideology, or to a political or religious argument. Such blinkeredness can lead you into the world of the fanatic, who maintains loyalty and devotion to a cause despite matters of personal safety or social responsibility. Thus the gift of this star is the joy of long-term friendships and relationships based on your loyalty, but real loyalty is also seeing and accepting the shades of grey in the ideas and people that you love. Sualocin is a small blue-green star in the western side of the dolphin, Delphinus. The Dolphin is a small constellation next to Aquila the Eagle in the northern hemisphere. The Dolphin has maintained its present form and shape for the last two thousand years and its stories are associated with helpfulness and playfulness. Thus the quality of this star gifts you with a natural talent or consummate skill in some area. How you choose to express it is up to you but it is a skill that gives you joy in its use. Additionally, you have a natural curiosity about the world that comes with the optimistic playfulness of this star. For you, happiness is exploring a new town or a new idea, discovering places that you have never seen. There is more to this star, however, than natural talent and curiosity about the world, for the Greeks considered this constellation to be linked with the Oracle of Delphi, suggesting an oracular quality to the star. 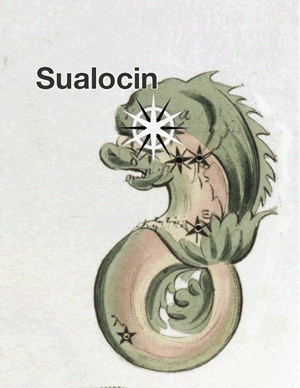 In this regard Sualocin, as the main star of Delphinus, combines an intelligent playfulness with an aptitude for dealing with one’s environment, as well as the ability to tap into instinctual knowledge, experienced by you as insights, or insider perspectives that appear to drop into your mind as you are going about your normal day. On the day you were born, when Mars was setting, Sualocin was culminating. This insightful and playful star is in paran with your Mars, so you have a natural understanding of how to enthuse other people, to know what will get them moving. But this star’s quality is more than being an inspirational motivator. It can also indicate the trickster, the person who can make others believe what is only an illusion. This is perfect for a stage magician but can lead to problems in other areas. You can sell an idea to people, and get them to invest in it. You easily persuade others to follow you in your visions or goals and, if you use this skill with sincerity, you become a leader with a vision, inspiring other people to willingly add their time and resources to enable the achievement of a common goal. If used dishonestly, it reduces you to a con artist. You could apply this star’s quality to your own family and friends, organising working bees to get a job done, or you could sell a dream to your community. You also have physical talents in terms of dance or sport, quick with your feet and reflexes, and you take pleasure in good-natured competition with others, reading the state of play, or your dance partner’s next move. Remember, your ability to motivate others to follow your dreams, or support your projects, is one of your greatest natural assets, so use it with integrity and it will reward you with a fulfilling life. The upper part of the image shows the eastern hemisphere of the sky, as seen at the time and location of your birth. It is centered on the east point (E).The lower part of the image shows the western hemisphere of the sky, as seen at the time and location of your birth. It is centered on the west point (W).The highlighted stars play a key role in this astrological reading. The red ones appear in chapter II, the blue ones in chapter III and the green ones in chapter IV.The bright halves of the diagrams show the sky above the horizon; the dark halves show the sky below the horizon.The horizon is indicated by horizontal lines, the boundary circles themselves represent the meridian. The planets (drawn red) move along the band of the zodiac. Dashed lines indicate the celestial equator and circumpolar circles.